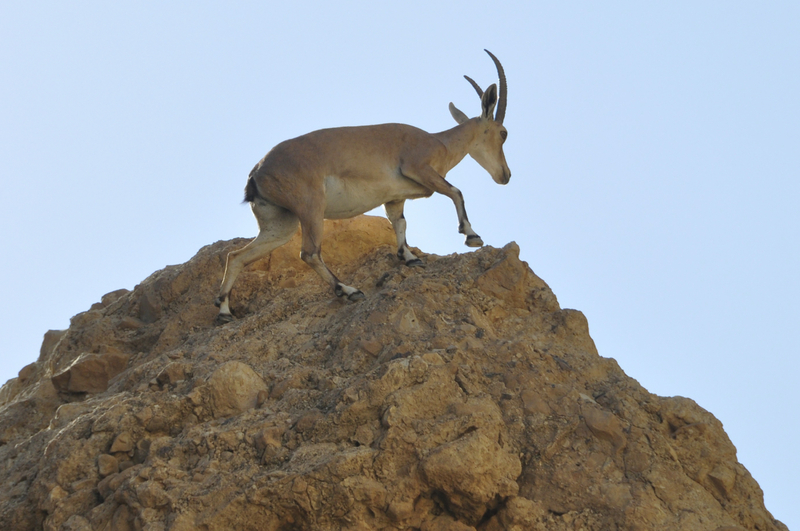 When hiking in the Ein Gedi nature reserve keep your eyes open for hyrax, Tristram grackle and ibex. As I was coming out of the reserve a group of some forty ibex went by. Their color blends into the cliff side but I caught this one as it climbed over the hill. The technical details – the photo was taken with a Nikon DSLR camera (ISO 400, 200mm, F11 at 1/500 sec). This entry was posted in Desert, Hiking, Nature, Photography and tagged desert, Ein Gedi, ibex, oasis on June 2, 2013 by Shmuel Browns. Wow. GREAT shot. Beautiful color.